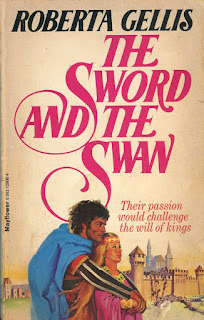 I was very saddened the other day to read about the death of much loved, multi-million selling historical and fantasy novelist Roberta Gellis. You can read a brief obituary of this remarkable lady HERE. Roberta was a long-serving class act of the romantic historical genre and one of the major inspirations and influences on my early career. She was also kind enough to talk to me via e-mail on occasion and we had several detailed and interesting discussions about our mutual interest in the twelfth century, its characters and politics. I first came across Roberta's work in my late teens. By that stage I had already embarked on my own (unpublished and a hobby at that time) historical writing. Having developed a passionate interest in the Middle Ages, I would haunt the library and devour whatever historical novels set in that period I could find. Being short of income at the time, the library was a godsend. The books that I wound up borrowing numerous times, I went out and bought when I had money from my Saturday job or was given book tokens for birthdays and Christmas. Together with Cecelia Holland and Dorothy Dunnett, Roberta Gellis was one of my library discoveries and auto buys. 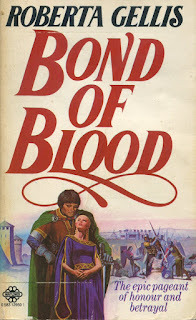 I picked up her novel Bond of Blood and was immediately captivated by the struggles of a young twelfth century bride and the scarred warlord husband thrust upon her by society during the anarchy period of Stephen and Matilda. Tortured heroes and Beauty and the Beast are stereotypical features in fiction of all categories but have a particularly entrenched home in historical romance where they can often be much of a muchness, but Gellis was an author who soared above the cliche. Her hero, the badly battle-scarred Cain had a club foot and his mother had died giving birth to him and his twin brother. His father, in grim bitterness had bestowed on him the biblical name of the man who had slain his own brother. Leah comes from a family where she is only valued as breeding stock, and has learned to be very nimble with her wits when it comes to peace-keeping and making the best out of her circumstances. However, she is no Mary-Sue but a resourceful and quietly determined young woman. She and Cain are married by force of dynastic and political circumstance, and how they come to deal with each other's flaws and fears, and to appreciate the finer points amid all the political machinations, makes for a terrific story full of emotional triumph and pain as well as edge of the seat adventure and skulduggery. For me the reader it was a wonderful absorbing, believable read. I enjoyed the more flighty historical romances I read, (I loved Kathleen Woodiwiss's way over the top epic historicals) but now I could clearly appreciate the difference between what felt like reality and what was more akin to getting out the dressing up box to flounce around in the costumes. Roberta Gellis made history live for me more than any other author had done up to that point. As a fledgling writer, she also taught me that it was possible to write romantic tales that were about people who were of their time. They thought like medieval people, they behaved like medieval people. They drew you into their world and made you believe in them and their dilemmas, all of which were utterly realistic. This was why I loved reading Gellis novels and this was what I wanted to write. Something that felt real to me. 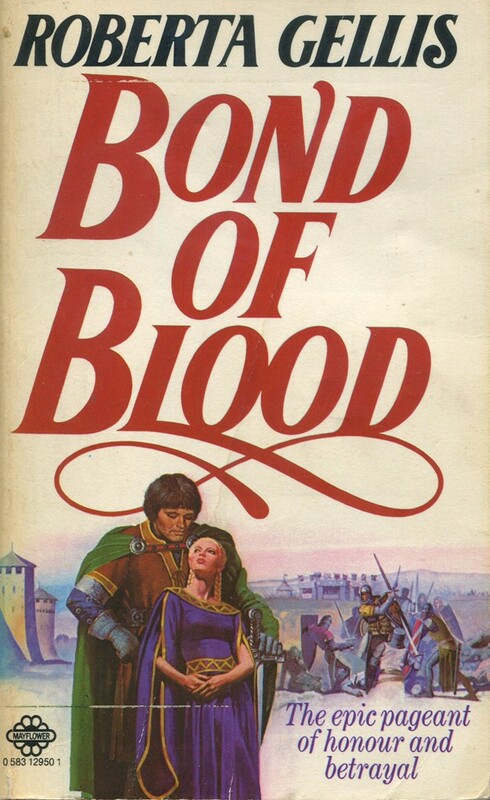 I continued to devour Roberta Gellis's medieval novels at speed. Knight's Honour, The Sword and the Swan, the Dragon and the Rose (where she took a positive view of Henry VII). But then, for me, Robert Gellis excelled her own already high standards and produced something rather special when she brought out her 4 book Roselynde Chronicle series - Roselynde, Alinor, Joanna and Gillian. In my opinion she hit the top of her game with these novels set in the time of King Richard, King John, and the early years of Henry III. Alinor, a wealthy young heiress who has been raised by her grandparents and given a somewhat enlightened education for a young woman, (although an education still of its time for the privileged) is given the middle-aged but vigorous and experienced knight Simon LeMagne as her guardian. What starts out in a certain amount of resentment, gradually blossoms into friendship, then love and marriage, but not without numerous trials and difficulties, including a journey on the third crusade where Alinor joins the household of Queen Eleanor of Aquitaine and Simon is attached to Richard's household. The other books in the quartet follow the fortunes of Alinor and her loved ones through the ending reign of John and into the early 1230's. In the course of the story, Gellis brings to life one of the 'hottest' romantic historical heroes ever in the second book, Alinor, in the form of Ian de Vipont, Simon leMagne's squire and later lord in his own right. Any woman who has not encountered Ian de Vipont and gone weak at the knees is lying. Gellis's skill lay in her ability to create a man who was drop dead gorgeous but at the same time the complete antithesis of the cardboard cutout he could so easily have become in less skilled hands. Ian de Vipont lives, breathes, walks off the page with all of his believable flaws and insecurities and sweeps the reader into his and Alinor's very real 12th century world. I read those books to shreds, especially Alinor. When they were published in a special hardcover edition along with two more in the series, I saved up to buy the two new ones, Rhiannon and Sybelle, and made sure I had enough over to by myself a new copy of Alinor. I have to say that the covers do not particularly do the content justice. The latter always outshines the former. 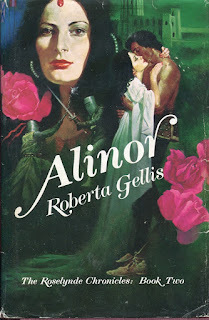 Gellis was later asked to write more in this series, and completed one more - Desiree in 2000, but she said that she did not want to go further into the series really because that would mean having to write the death of Alinor and it was not something she was willing to do. In her later career Roberta Gellis dabbled in the popular historical mystery genre and introduced readers to the wonderful new heroine Magdaelne la Batarde, high class brothel keeper of mid 12th century London. Just as her earlier medieval novels straddled the line between the romance and the straight historical, so her Magdalene novels - A Mortal Bane, A Personal Devil, Bone of Contention and Chains of Folly, were as much historicals as mysteries, with the same evocative sense of period and personalities. I have yet to read Gellis's novels set in the world of Greek mythology and there are sundry medieval and other works that are still on my to read pile but it means I still have work m of hers that is new to me even though no more will be written - a poignant thought. I am so sorry that such a lovely, talented lady, who has given millions of readers so much pleasure for so many years has passed away, but what a legacy she has left behind, and I honour her now and extend to her my heartfelt thanks both as a reader and a writer. 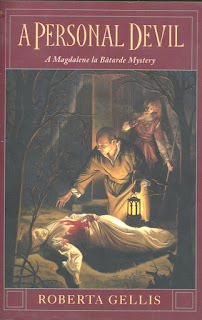 This is a new author for me - have just ordered a copy of the first La Batarde series. Spade and Dagger - ditto! I've found in your novels the same amazing fidelity to history and depth of story that I found in Ms Gellis' novels. I've been fascinated by English Medieval history and literature since I was a teen, and The Sword and the Swan hooked me with it's gritty, flesh-and-blood historical characters . She kept me reading with her fidelity to history: she had a Bibliography. For a novel. She cited the Gesta Stephani for a novel! Thank you for a lovely tribute. And for novels that take me into the world and hearts of William and Eleanor and Mahelt and Ida.